Will CBD get me high? Nope. Atleast not the CBD I use . Hemp derived CBD is also LEGAL in all 50 US States! In December 2018, the US Farm Bill was updated, specifically separating industrial hemp from cannabis allowing it to be grown again across the United States. Cannabinoids (CBD) are chemical compounds that are naturally found in the body and some plants. Cannabidiol is the most common, making up 40% of the cannabis plant and it was first discovered in the 1940’s. There are more than 100 cannabinoids that have been discovered since that time. Did you know that you have an Endocannabinoid System (ECS)? The ECS was discovered in 1992, this is why I was not taught about this in high school (MHS Class of ’88). The ECS is a body system in humans and animals containing CB1 and CB2 receptors for cannabinoids. It helps regulate our bodies to homeostasis and prevents disease and aging. Most people are aware of THC which is also a cannabinoid but causes a psychoactive high. It was discovered in the 1960s. 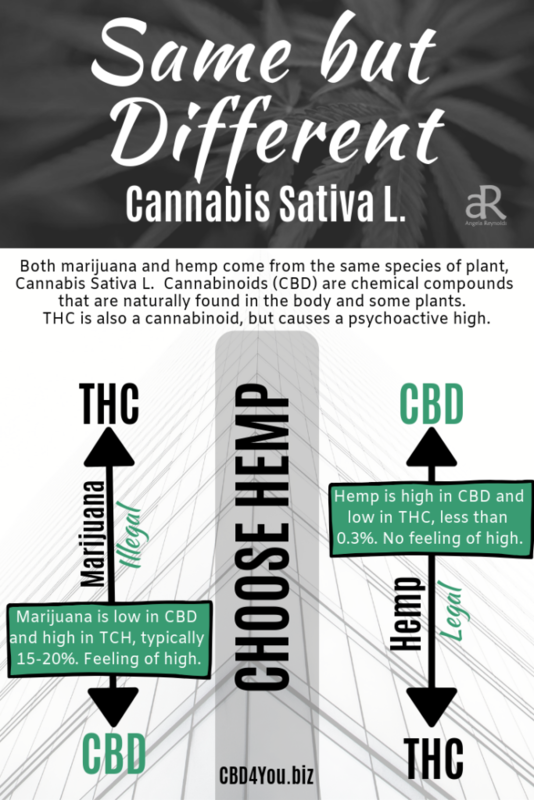 Both hemp and marijuana come from the same species of plant, Cannabis Sativa L. Marijuana is low in CBD and high in TCH, typically 15-20%. Hemp is high in CBD and low in THC, less than 0.3%. It’s important to choose an affiliate that is supportive and helpful. I’m committed to my team in answering questions and providing support. Let me help you as you endeavor into this healthy journey. I provide ongoing education. You will also be included in exclusive Facebook support groups. Let me help you help yourself! Take the FREE TOUR today!